Why is SPAC3 a big collective work of art? 1° SPAC3 is itself a work of art as it corresponds exactly to Michelangelo Pistoletto’s artistic process, starting from the Mirror Paintings from 1962. In those works, we see ourselves as part of the painting and, behind us, we see the environment and the people surrounding us. The Mirror Painting is therefore a pre-technological artistic selfie. 2° With SPAC3, the mirroring work extends to planetary proportions, since the astronaut Paolo Nespoli will act like a mirror for Earth’s society. From our planet, the selfie will be realized reflecting ourselves in his photographs, i.e. inserting our pictures in his (connected to the symbol of the Third Paradise). 3° Through the app, we will be able to see the images created by others together with the image created by us. In the app, the symbol of the Third Paradise is the support on which everybody’s artistic selfie is fixed. 4° The symbol of the Third Paradise will include the work by each participant and be at the same time included within each work. This is how the symbol will spread and become familiar to everybody. 5° In Pistoletto’s work, the Third Paradise comes out of the symbol to become practical, extended and shared activity of “responsible innovation of society”. Hence, together with the diffusion of the symbol, an interpersonal connection progressively developing a real change in society gets activated. The 17 UN sustainable development goals are the guidelines. The Third Paradise in space! Visit Spac3’s website and follow the mission on Facebook! The Third Paradise is about to dove among the stars for the mission VITA, acronym of Vitality, Innovation, Technology and Ability. It is the mission Expedition 52/53, whose destination is the ISS (International Space Station). It was the third of six long lasting missions NASA made available to the Italian Space Agency within the agreement of the delivery of the logistics modules Leonardo, Donatello and Raffaello. The European Space Agency astronaut Paolo Nespoli left for the ISS on 28th July 2017. The name and logo of the mission were inspired by Michelangelo Pistoletto’s Third Paradise. For the first time, an artistic symbol has connoted and created the backdrop for a space mission. The logos’ blue circle recalls our planet, while Pistoletto’s symbol connects the main messages of the mission. Three are the elements highlighted: a thread of DNA, representing life and science; a book, representing culture and education; and the Earth, as symbol of humanity. 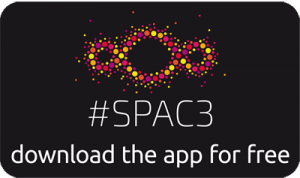 The context of the mission saw the launch of the app SPAC3, developed by the ESA with RAM Radioartemobile, in collaboration with the ASI and Cittadellarte-Fondazione Pistoletto, to raise awareness about the preservation of the Earth, involving the public in the creation of a social work of art. The app SPAC3 allows you to have your say and share a message about six different topics, which include the 17 Sustainable Development Goals, defined to resolve the most important global issues relating to the people, the planet, prosperity, peace and partnership. With the new app, you are able to follow the mission and realize photographs superimposing them to the pictures taken by Nespoli from a platform with a view of the Earth, with the opportunity to create special collages. A way to get close to space with a click, but above all to spread the concepts of the Third Paradise taking part in a collective and global work of art. The images and the app are free to download and use; a way to favour creativity’s ascent to the throne.